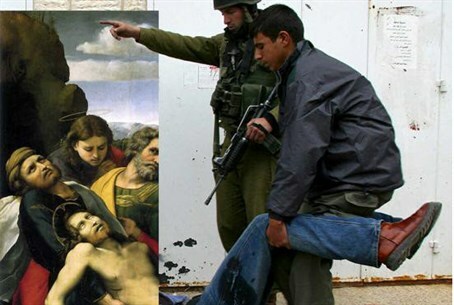 The Palestinian Authority (PA) plans to modify history by modifying classical art, in an exhibit it commissioned to show Pope Francis during his visit to Bethlehem next Sunday, which presents Jesus as a "suffering Palestinian." 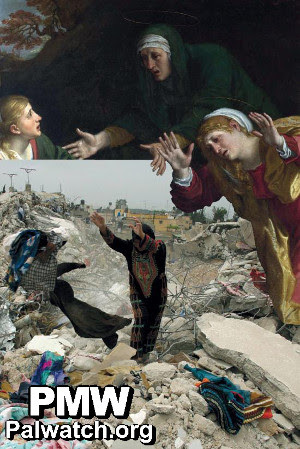 The Palestinian Museum arranged exhibit features an array of collages mixing classical paintings of Christian art with photographs of what are to be taken as "oppressed" Palestinians. 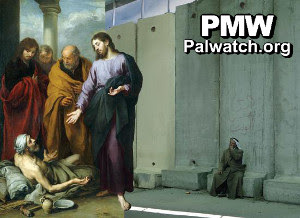 The exhibit, which will be on display at the Church of Nativity courtyard and Deheisheh refugee camp, both locations the pope is to visit, will be up throughout the coming week, according to the report in the official PA daily, which was translated by Palestinian Media Watch. The PA Presidential Higher Committee for Church Affairs that initiated the exhibit was formed by PA Chairman Mahmoud Abbas, according to its website. Abbas was derided last December for the ahistorical claim that Jesus was a "Palestinian." According to the PA daily, Al Hayat al-Jadida, the purpose of the exhibit is to deliver the message "put your finger on the wound and be convinced of my existence," a loose interpretation of a quote in the Christian Bible (John 20:27). 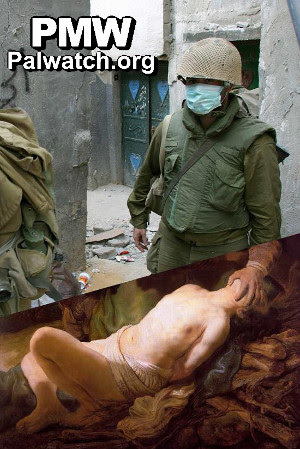 "While the classical paintings were selected to represent scenes from the New Testament, which took place in Palestine in the distant past, the photographs reflect the painful reality the Palestinians have experienced and still experience under the occupation," reads the Al Hayat article. The Palestinian Museum website added that the exhibit highlights "the tension between the popular image of the Holy Land and Palestine's ongoing history of suffering under occupation and oppression." One work on the display is a modification of Raphael's "The Deposition" (1507), which depicts the dead Jesus being brought to his tomb. The PA version weaves in a wounded Arab man being carried away as an IDF soldier supervises. Another example is the modified version of "The Incredulity of Saint Thomas" (1602) by Caravaggio, in which Jesus's wounds are inspected to test his "resurrection." In the new version, the wound is replaced with a local Arab presenting an identity card, with Thomas in the role of an IDF soldier inspecting it. The identity card sends a message that Jesus was "Palestinian." In Carracci's "The Dead Christ Mourned" (1606), dead Jesus is presented with mourners around his corpse. The PA version replaces him with an Arab woman standing in rubble. "Christ healing the Paralytic at the Pool of Bethesda" (1670), by Murillo, shows Jesus curing a sick man. The exhibit's version shows an Arab man sitting by Israel's security wall in place of the pool. A final example from the exhibit is Rembrandt's "The Sacrifice of Isaac" (1635), which shows the angel preventing the Jewish patriarch Abraham from sacrificing his son Isaac with a knife while covering his face with his hand. The PA version has an IDF soldier in place of Abraham with his hand over the Jewish patriarch Isaac's face. For the pope's part, the Vatican has revealed he will demand the "Palestinian people's right to have a homeland, sovereign and independent," during the visit. The pope has been remarkably tight-lipped over the violent persecution of Christians in Bethlehem, where the exhibit showing Jesus as "Palestinian" will be held, instead choosing to condemn alleged Jewish "price tag" vandalism.